Blue mussels (Mytilus Edulis) have a smooth, bluish-black shell. Wild blue mussels and tend to live in coastal estuaries or near shorelines. Wallaroo jetty is full of them.They often grow in clumps, attaching themselves to rocks or to each other by means of sticky filaments, sometimes referred to as a “beard”. They are typically harvested by hand at low tide. In the North Atlantic, blue mussels are often grown using a variety of methods, but most methods share common traits, usually providing some means for mussels to anchor and live above the sea floor. 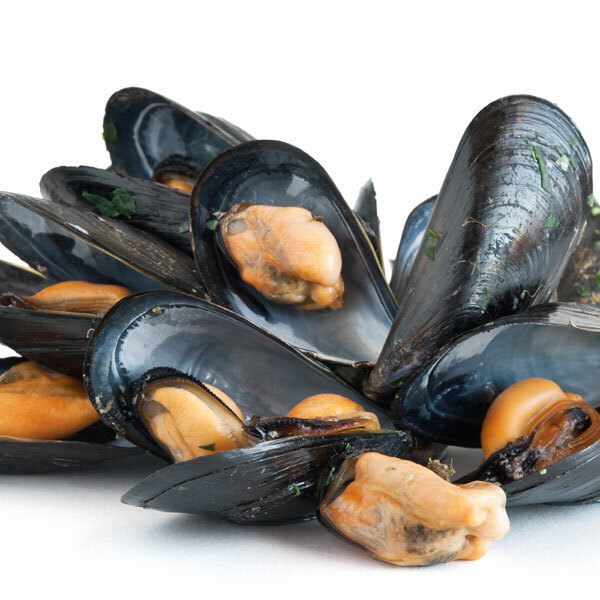 Blue mussels inhabit a wide range of estuarine and marine environments. They attach to rocks, jetties and piers and sometimes form dense beds on sandy flat substrates. They can be found from the low tide level to a depth of 10 metres, and they prefer sites with significant water movement. When collecting Mussels do not remove them from steel columns or bolts as they can become toxic. Blue mussels have a minor spawning period in June, followed by a second, extended spawning period from August to January. Spawning occurs at water temperatures of 14°C. Blue mussels are “broadcast spawners” releasing eggs and sperm simultaneously into the water with fertilisation taking place in open water. Did you know? he colour of the mussel meat varies slightly – the girls are pink and the boys are paler ! !